The new Fashion Video Name Tag fleece is a shawl collar fleece sweater with a windowed pouch on the sleeve. 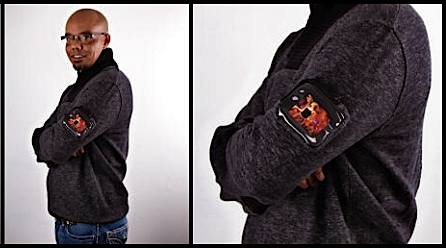 Created by Sean John (aka Puff Daddy, aka P. Diddy, aka Diddy), the sweater lets you show off a 2.8" OLED display, thus wearing your media choices on your sleeve. The palm-size unit has 2GB of onboard memory for storing video or slideshow playlists, so wearers can customize their sleeve showings, and it boasts up to 10 hours of battery life. The shawl-collared sweaters went on sale at select Macy's stores this week for $98. The OLED device is going for an introductory promotional price of $125 (regularly, it sells for $198). Durand Guion, Macy's vice president of men's fashion, spotted the Video Name Tag at last year's Consumer Electronics Show and asked Sean Jean to incorporate it into his threads. While the sign's generally been used as a promotional device for businesses, it may be getting a lot more nightlife action now that it's making its way onto consumers. "Just think of all the attention you'll get at the clubs!" reads a Macy's blog promo on the product. I'm pretty sure sf great Murray Leinster would have been down with it; check out the sleeve communicator from his 1945 short story First Contact.